Maybe you’d like to mingle with mutts as a “doggie dietitian” (how fetching!). Or tend to crops and harvest nature’s best nutrition as an RD farmer. Whatever your fondness in this field of vast opportunity, we hope this article will inspire you to pursue your passion. Tired of the day-to-day drudgery of a clinical 9-to-5 job? Or maybe you love what you do but you’re feeling an itch for “something more” or the twitch of “what’s next?” in your soul. Searching the job boards may worsen that feeling. Marianne Patino, MS, RD, CDN, co-owner (with her husband) of the job-listing site DietitianCentral.com, says the vast majority of job postings she sees are of a clinical nature. “Ninety-nine percent of [postings] are mostly clinical positions, either in a hospital setting or a nursing home setting; that’s the majority,” she says. That doesn’t mean the more clinical positions are completely lacking in excitement or joy, as many RDs can attest. But if you’re looking to break out of your nutrition shell and try something new, you’ll be happy to know there are a host of less-traditional dietetics opportunities out there. Whether it’s a nutrition clinician for clients on all-fours, an RD who spends her days in the sun tending to fields, or a dietitian who caters to a celeb clientele, this sampling of unique jobs may just give you the courage to explore the less-traveled RD path—or maybe even make your own. Postings for farmer-RDs may not make it onto job sites, but that doesn’t mean opportunities don’t exist for those who are interested in trading in their current title for a complete lifestyle change. And a small but growing group of RDs who double as commercial farmers is giving some credence to the also-growing sustainability movement. Diana Dyer, MS, RD, is one such RD who took the plunge in 2009, purchasing the property of what would become The Dyer Family Organic Farm in Ann Arbor, Mich., after 20 years of working in an ICU as a nutrition support dietitian along with multiple other endeavors. Dyer explains that in a farmer’s life, planned activities are dependent on weekly and daily projected weather forecasts, “which is always subject to change based on—how can I say this—’crisis management.’” Barn building and hoop house planning, determining future crop plantings and actual plantings, and crop maintenance and record keeping are just a few of the multitude of any farmer’s responsibilities. Still interested? If so, Dyer explains that clinical experience may help you as much as it’s helped her acclimate to this new working pattern: “Being a pioneer critical care/ICU dietitian in the initial years of nutrition support taught me how to be a team player, network, and market the strengths and attributes that my nutrition knowledge brought to patient care. These same skills are beneficial and will help us both see and make the connections in our local food community in order to make our farm profitable as a local business.” She notes that critical thinking, problem solving, and creativity skills all come in handy on the farm. Dyer’s fondness of feeling connected to the earth—having her hands in the soil, feeling the sun on her face, and most importantly knowing where her food comes from—first attracted her to this new way of life, but what holds her interest? “No two days are alike,” she attests. She explains that RDs looking to get their hands dirty daily “need to fully understand all the factors that allow us to be at the starting point of ‘we are what we grow’ instead of ‘we are what we eat,’ which is the typical starting point of how dietitians’ traditional training has us usually think. “In addition, obviously RD-farmers are running a business, so we need to know all aspects of how to do that profitably, all the while knowing that extreme and unforeseen and uncontrollable weather can undermine all your planning in a minute,” she adds. And while the challenges faced by farmer-RDs, especially new farmers, are many and myriad (“Many things to do with not enough hours in the day to do them all, and they all feel like they should have been done yesterday!”), Dyer says she sees this newest endeavor as the purest kind of disease prevention. “In my view, farmers are really our frontline healthcare practitioners by maintaining the healthy soil that grows healthy food that nourishes healthy people who create healthy communities,” she says. If you’re intrigued by how the rich and famous stay healthy and beautiful and are looking to counsel high-profile clientele, then Los Angeles may be where you want to be—practicing, that is. At least, that’s where Ashley Koff, RD, founder of Ashley Koff Approved, sees patients on Tuesdays and Thursdays. There are definite perks of working alongside celebrities, and as such Koff notes having the opportunity to dine at some of the greatest restaurants with clients and pick out their order, or even just dine with them, in addition to plentiful travel opportunities for her corporate clients. “I also get to have meetings backstage before a rock concert, on a set, or [at a] ball game—and that’s been fun, too—but it’s where my clients work, and I have to remember that, too,” she says. Remembering to keep your cool and having confidence in your nutrition expertise, even in the company of celeb clientele, are requisites for this dietetics position, as is keeping mum about client names (no matter how famous) in order to stay within HIPAA privacy regulations. Be advised, however, that counseling higher-profile clients sometimes brings higher demands, which can either add excitement or stress to your day, depending on your personality. “I’ve been asked to meet people at their private plane, work with a hotel or private chef, or visit them in the hospital to coordinate their care with professionals there,” says Koff, who thrives in this fast-paced environment. One new challenge Koff learned through her jet-setting clientele was how to respect her own time—even if someone else didn’t. “I am always up front about what my fees are and if someone wants me to jump on a Saturday to see them—and I am available—I will let them know that my time costs more that day than if they want to wait until an office visit,” she says. Koff remembers a day early in her career when she was driving to a musician’s house—one whom she had worshipped as a teen. “Driving up to the house, I had to take a deep breath and then I just screamed to myself in my car ‘I can’t believe this!’” she remembers. “Then I went into the house, met the wife, the kids, and we sat down and talked about his personal health goals. Just another day at work, eh?” Just another day at work … at this dietitian’s dream job. Are you the biggest NFL (or NBA, NHL, etc) fan you know? If so, imagine merging your love of sports with your profession; that’s exactly what team dietitians do. Otherwise known as sports nutritionists, RDs in this position are employed by a professional sports team and work in both a one-on-one and a team setting, developing menus for players and answering their food-related questions and queries. A sports nutritionist works as part of an interdisciplinary team of professionals who work together with one end goal in mind: maximizing athletes’ potential. For those with a desire to break into this nutrition niche, beware but don’t be daunted: The opportunities are limited, as not all sports franchises offer such opportunities. It’s also a highly coveted position, and it’s typically not full time, so determination and flexibility are keys to nailing down a position in professional sports nutrition. Roberta Anding, MS, RD, LD, CSSD, CDE, an American Dietetic Association spokesperson and sports dietitian for the Houston Texans NFL franchise, explains: “The time commitment for me is about 15 hours per week and flexibility is the key. In sports dietetics, you have to be there when the athlete is available. In the NFL, players can be fined for being late for meetings, which oftentimes begin at 8 AM, so I am at the stadium at 6:30 AM or at lunch,” she adds. Mitzi Dulan, RD, CSSD, has been the team nutritionist for the Kansas City Royals baseball team for roughly six years. She served as the team nutritionist for the Kansas City Chiefs for eight years and has also worked in different capacities with professional basketball and hockey teams, so she can attest to the wide variety of duties a sports dietitian can have. She even coauthored the first book written by a pro-athlete and his dietitian, The All-Pro Diet, with NFL-er Tony Gonzalez. For the Royals, she visits with the team two or three times per month when they’re home, where she’ll touch base with players and make diet suggestions—for general meals and for what to eat before and after batting practice and games. She also provides a yearly team presentation during spring training. Then, on a more ongoing basis, she responds to various athletes’ needs as they come up—whether it’s answering questions about a certain supplement, giving athlete wives cooking ideas, setting up personal chefs for athletes, or texting with players who have quick nutrition questions about foods when eating out or grocery shopping. Anding explains, however, that there are qualifications—beyond just having an RD behind your name—that are necessary for getting into this field. “Fundamentally, just being an RD does not qualify you to be a sports dietitian. … You can’t just ‘do’ sports nutrition,” she explains. “You have to develop and maintain the skills.” She recommends that RDs earn the CSSD credential if considering pursuing this type of opportunity. “If someone’s considering getting their master’s in nutrition, I would suggest instead to get their master’s in exercise physiology if they have an interest in sports nutrition,” says Dulan. The jobs in this niche are few and the competition fierce, but the perks for a sports fan are unmatchable. “It’s definitely fun, especially if you’re a sports fan. You get to go to games and get good seats,” says Dulan. This offshoot of sports dietetics involves working with another distinguished set of athletes: our nation’s soldiers, sailors, marines, and SEALs. If you think you have what it takes to counsel the brave men and women who serve our country, then this career might be for you. Lori Tubbs, MS, RD, CSSD, is one such nutritionist who works as part of a Navy SEAL human performance team that also includes an athletic trainer, a program manager, and a certified strength and conditioning specialist. She’s been working with the SEALs community for the past 12 years. “I am a Department of Defense employee working for Naval Special Warfare in Virginia Beach. As a civilian working for the military, the field of sport dietetics is in its infancy. … Rather than working within the healthcare setting, my work involves improving healthy military athletes by teaching nutrition principles based on the professional sports model,” she says. As is common with many nontraditional jobs, there is no one typical day as a military nutritionist, where training cycles dictate many of the needs for individual troop members and nutrition-related requests from military leaders. “This includes travel to training sites to evaluate the nutrition environments and develop meal plans using local vendors to assist in feeding these athletes,” Tubbs says. Referrals are a must in this line of business. Porter first receives a referral from a veterinarian or client and then contacts either one as needed to clarify the nutritional need. “Then I prepare the care plan and dietary recommendations. The veterinarian always gets a copy of the report for the file and review,” she says. In the past, Porter has worked with various animals in assorted capacities. For example, she developed an enrichment and feeding program for otters at Busch Gardens in Florida and she also helped design a feeding program for orphaned river otters at the Mississippi River Museum in Dubuque, Iowa, where she even calculated the calorie requirements for a pregnant river otter. However, most of Porter’s clientele are domestic pets, with only a small portion coming from work with zoos. Porter’s general love of animals may have piqued her interest in this self-made opportunity, but earning a master’s degree in animal science with an emphasis in animal nutrition helped ensure she could serve her clients best. Those who are thinking about trying out this consulting business may want to keep Porter’s experience in mind and ally with a local veterinarian, who can act both as a mentor and a future referral source. Even with all of the differences between people and their furry friends, Porter says the challenges can often be quite similar. “If I have a client who does not follow the recommendations and then wonders why the pet does not do well, it is very frustrating,” she says, noting that many veterinarians do not yet understand the value of nutritional intervention. “This field is where human nutrition was many years ago, so time is needed to close the gap,” she says. How many other pet nutritionists are out there is currently unknown, and Porter has primarily had to create her own path down this animal-focused profession. But her practice has thus far survived an unwelcoming economy, which gives hope for other animal-loving RDs. However, if you’re thinking about extending your clientele to those with four legs, you may not want to quit your day job—just yet anyway. Porter explains that she works as a clinical dietitian in a hospital full time and then consults as a pet nutritionist on the side. “When I started working with the internal medicine specialist veterinarian, who now sends the most referrals, he told me, ‘Don’t quit your day job.’ Good advice, as this field is very new and does not provide enough income to live on,” says Porter. Sometimes a less-traditional dietetics position can stem less from its duties and more from its location. RD overseas positions are as varied as their locations, and options can seem endless. Whether as a hospital dietitian in the United Arab Emirates or an RD working on immunizations in Kenya, one thing is for sure: This type of opportunity promises cultural challenges on top of those associated with typical job responsibilities. Bovill’s curiosity about the world beyond U.S. borders cultivated her desire to work abroad, yet she notes that it’s certainly not without its challenges. “The challenges in this job are many. Adapting to the environment and cultural differences has been fascinating. 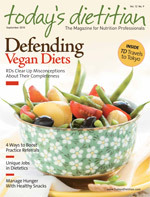 Learning to focus on how to be effective and be a part of sustainable changes has been a daily lesson,” she explains, recommending that any RD interested in overseas opportunities check out the American Overseas Dietetic Association at www.eatrightoverseas.org. Or consider Amanda Paltzer, RD, who was a nutrition consultant in Zambia, as your inspiration for finding dietetics work around the world. Finding herself in the African nation due to her husband’s work, she created a nutrition niche for herself. “I conducted nutrition counseling at two different clinics where I saw a variety of patients—from undernourished children to adults with hypertension and diabetes. Patients were referred to me by the physician,” she says. Paltzer found the lack of emphasis on and knowledge of nutrition abroad to be a primary challenge for her. “Dietetics is not well recognized or understood in Zambia at this time, so while I worked I also had to promote the importance and need of the profession among patients as well as colleagues,” she explains. She notes that language and cultural preferences can be barriers in any foreign land. “I learned some of the language to better communicate and had to be very aware of cultural preferences and dislikes when it comes to food,” she says. “Keep your mind open to all opportunities, near and far,” advises Bovill. And when the job you’re seeking seems out of reach (or nonexistent), follow the path of these RDs—and do the work to make your own dietetics dream job come true.